Some idiot threw out a perfectly good (or so it seemed at the time) Bell & Howell 16mm projector at university (if you're the aforementioned idiot, could you tell me if you've got any films to go with it? Thanks.). BTW, that was on the 9 Dec 2005. It looked in great condition untill I took the back off. 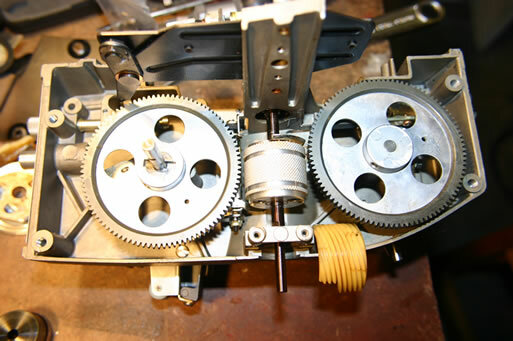 The helical gear that drives the upper and lower film winders had broken into pieces. The cause was probably its construction; it was a plastic gear formed over an aluminium hub and it had stretched and cracked with age. I looked around a couple of sites on the web but nobody seemed to have a spare gear. Sooo.......I decided to make one! It's a nice little engineering challenge. First of all, the gear specs. It's a 7-start helical gear with a pitch of 17.5mm (that's a spacing of 2.5mm between adjacent teeth). OD is about 30.2mm and tooth depth is around 1.8mm. Here's a couple of shots of where the gear was. 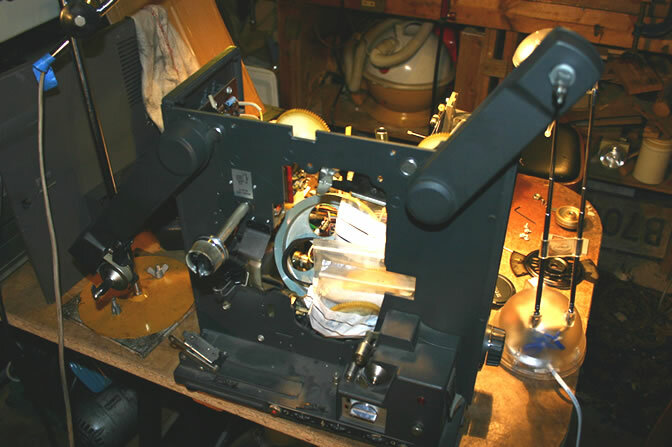 The yellow thing is part of the original gear; I used this as a template for grinding the cutter. 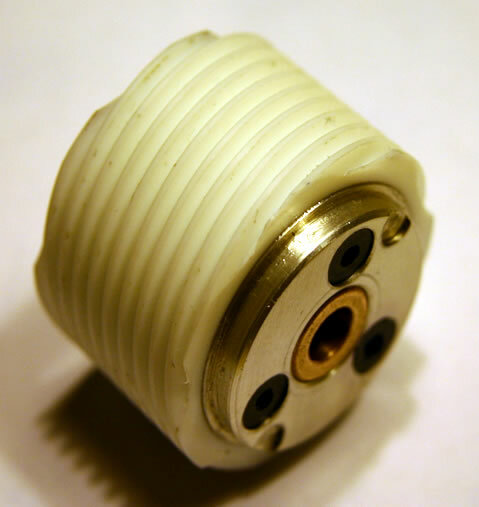 The knurled aluminium hub is what the gear was attached to. 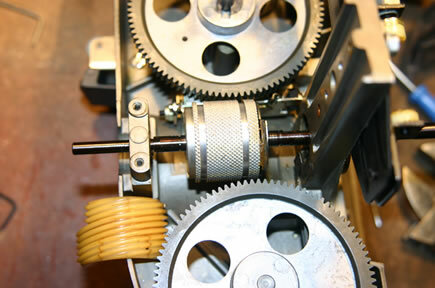 The two helical spur gears drive the upper and lower film winder sprockets. Right, we need a cutter. I made up a little arbor from some 3/8" silver steel rod and made a cutter from some 1/8" gaugeplate. 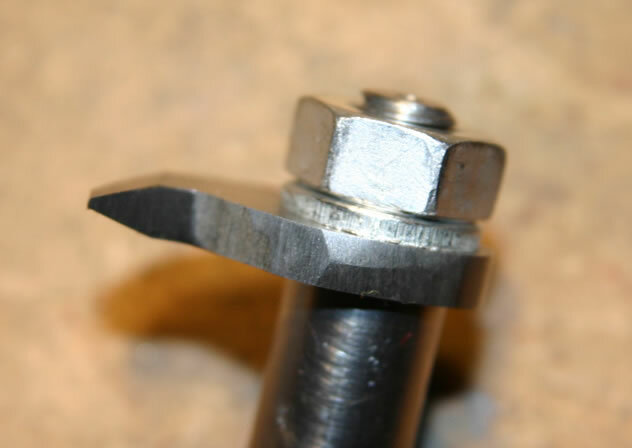 Here's a shot of the cutter showing the shape of the tooth. It took quite a bit of trial and error to get it to that shape! Next I made an arbor in the lathe to hold the gear hub. 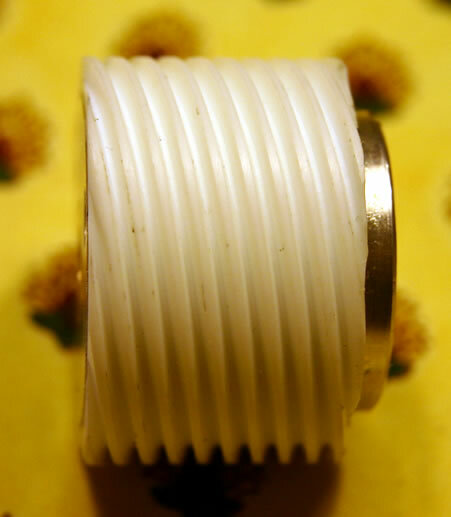 It's got a 1/4" shaft and the end is threaded 1/4x32 for an impromptu nut made from some rectangular brass bar. 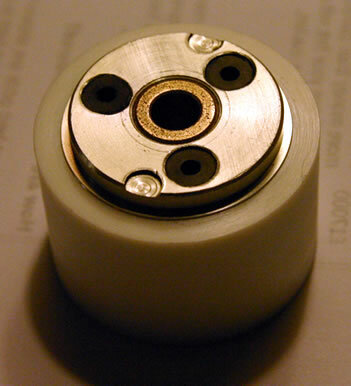 The plan is to turn the hub smooth then make a Delrin piece that's a press-fit over it. I've missed out a few steps here since it was late at night and I wanted to get something done before the next day! 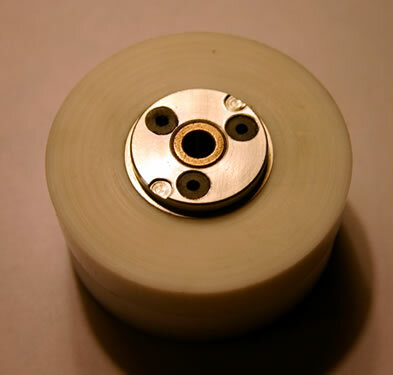 Anyway, here's a pic of the Delrin rod press-fitted over the hub. 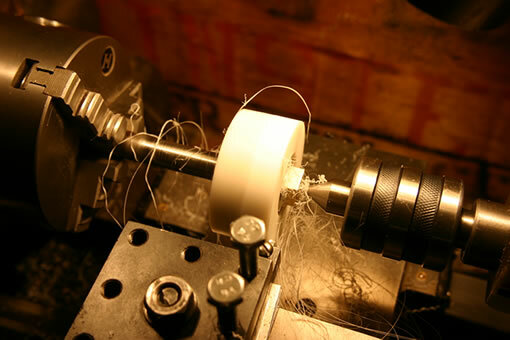 Turning down the Delrin on the lathe using the arbor again. 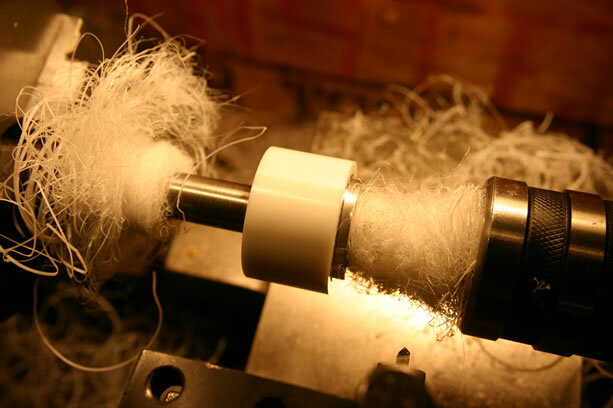 Finished turning the Delrin to 30.2mm OD. Here's the completed gear blank ready to be cut. I discovered that the Delrin loosened slightly as I turned it down so I scored both the hub and the Delrin and glued them together with epoxy. Now for the really fun part! Here's the gear cutting setup. 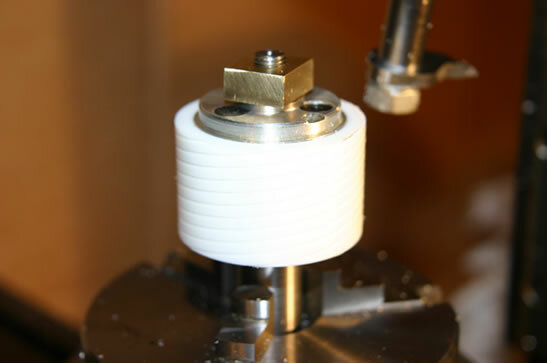 The gear blank is attached to the arbor and this is held in the chuck on the rotary table. 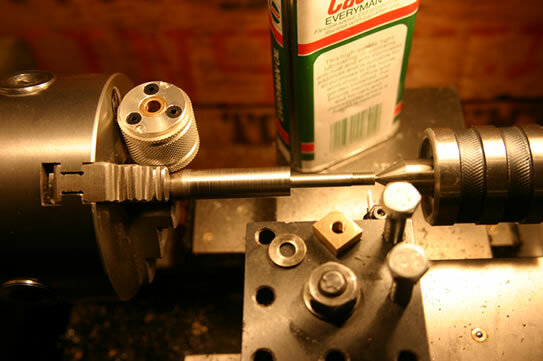 The cutter is mounted in a 3/8" endmill holder on the spindle. 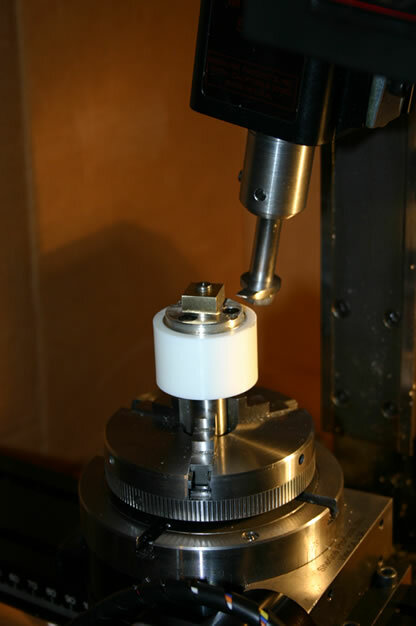 The spindle is tilted 11.5° from the vertical to allow for the helical nature of the teeth. To calculate the angle to tilt the spindle, use angle=arctan(pitch/circumference) where circumference is the circumference of the gear blank. The gear has a pitch of 17.5mm and I want to make the cutter move 30mm in the Z (vertical) direction in order to cut the full length of the gear. The gear blank has to rotate 360*30/17.5=617.143 degrees as the spindle moves down 30mm. In actual fact, it turned out the the cutter worked better cutting on the "way up" i.e. with the Z axis moving upwards. Starting at the bottom, the Z axis moves up and the gear blank rotate in synchrony. 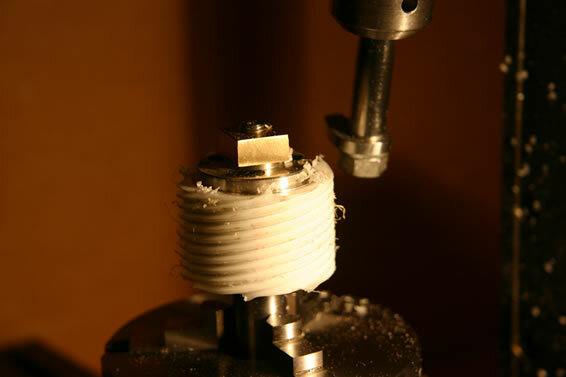 This produces a helical tooth with the correct pitch. To produce the other teeth, the gear blank is indexed 360/7=51.429 degrees and the process repeated. This might explain things more succinctly: G01 Z0 A-617.143 F100. That's the G-code command I used to cut a single tooth. 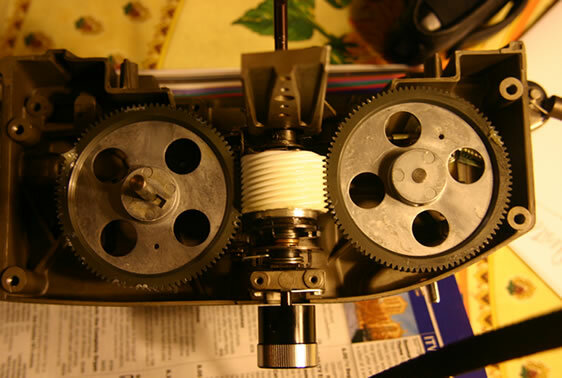 Two shots of the finished gears with burrs removed. The gear in place. It fit perfectly first time! Note that I said it FIT perfectly - it didn't TURN perfectly! It was a bit tight so the motor didn't turn at the rated speed (i.e. any movies would be slow). I'll have to take it all apart again and have a little file at the teeth to see if I can free it up. I can't put it back on the mill unfortunately because I wouldn't get things lined up again. Added later: Actually, I did manage to mount the gear back on the mill (I hadn't moved anything so I just had to reset the Z origin) and took another 0.1mm out the teeth. It now turns smoothly in the gears!